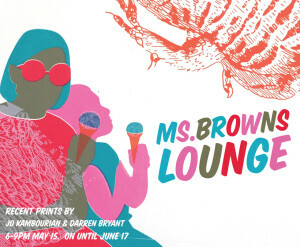 Poly Gone Cowboy presents ‘recent prints by Ms Browns Lounge’, featuring the dynamic printmaking duo; Joanna Kambourian & Darren Bryant (aka.Ms Browns Lounge). This new art exhibition features a curated selection of Darren & Jo’s work since forming the collaborative print & design studio, Ms Browns Lounge in 2010. Friday 15th May, 6pm – 9pm. Show runs May 15th – June 17th.